Help your cakes stand out in the display case with this 12" gold cake circle. This sturdy corrugated cake circle can support heavy cakes while maintaining a trendy style. A laminated gold coloring on the top of this circle ensures your creations stand out for a stunning appearance. The lamination adds an extra layer of protection, preventing grease and oils from seeping into the cardboard and weakening it. This circle also features a scalloped edge which adds another stylish feature to your presentation and highlights your culinary creations. These are great for cakes and desserts. Not only are they strong and Greaseproof, it's also beautiful. The gold is beautiful it adds a elegant touch to all your desserts. I love these boards! They are affordable, and add to any cake perfectly to make a better presentation. I found it sturdy and easy to handle with the weight of the cake. I am in love with these gold cake rounds. We use them for our 6" and 9" round cakes and worst best for our fun holiday cakes. Easy to clean and very durable. I really like this product. My cakes look very elegant and professional. I've bought several different sizes and always come back for more. You really can't find a better deal out there for them. I bought these in bulk so they will be cheaper per board. I use them to place my 9 inch cakes on that are already on an 9 inch cake board and then place it in a 12 inch box. it adds presentation to the finished cake. if the cake is on the heavier side i stick two boards together. These gold laminated corrugated cake circles are circular. As far as corrugated cake circles go, these circles have a big foot print but do not look un-elegant. We like thinner ones but these will do just fine. We use the Gold board for our cakes. They are so convenient. They save time and money. You don't have to wrap them, they are ready for your cakes. I am in love with these cake boards! They are very sturdy. I use it to put my 6 and 8 inch cakes so that I have enough of the board showing because it looks so professional. My go to cake boards! These gold cake circles, are thinner and flimsier then I expected, but glue 2 or 3 together and it makes a beautiful cake board, that doesn't need to be wrapped or covered. Great quality cake boards. At first I was nervous of the quality. Like they say u get what u pay for but by all means I got more than I paid for. Awesome price and great quality cake circles. Durable and presentable. Love the color of these cakes circles. Looks real good for events. They are sturdy and dont bend holds cakes will up to 3 layers. I am a very happy customer! So glad to purchase this product. I always use the 9" cake with larger cake circle. It allows me to decorate the cake easily. Perfect cake board, it's a little bit thick, so it's not fragile at all. Grease proof and moisture resistant. Perfect for 9 inch cakes, all our cakes are put on these cake boards. We use these for single layer 10" cakes and they're perfect. Not sturdy enough for a tiered cake (it's just one layer thick) but great for regular cakes! If your looking for a good, sturdy 12" cake circle this is it. Very sturdy but so pretty to use. Holds up very well as I've placed 3 layers cakes on these and it holds up wonderfully. We use this gold circle in our French bakery. It look really nice under a large fruit tart. We use it for 10 people tarts . Really nice gold boards for all treats. I use them for cakes, and cupcakes. Perfect size for a 10" cake or smaller size cake. Will order again! These gold cake boards were just right for my Valentine's cake orders... The boards are very durable and I will be ordering more for sure! The look of class. I really love the polished look of my products. So do my customers. Definitely a must for inventory. Beautiful touch to add for the little ok of professionalism. I am so in love with this product. Not only was it super affordable but I love the sturdiness of the board and the polished look for an easy cleanup after frosting. Very pleased, will definitely be reordering!! I love these gold cake circles because they give cakes a great finish. I use them for my ten inch cakes especially when I use extra frosting. These cake circles are very pretty. We actually used them as place mats and they looked really nice. They add a fancy element to all of your desserts. Great quality for a great price! The gold color definitely makes cakes stand out and presents them very well. Will be purchasing again. Fits perfectly with the 12" x 12" x 5" cake box. These cake circles in gold laminated corrugated 12" seem like a very good quality. It is nice that they are grease resistant. I will use these a lot. I LOVE these cake board circles!!!! They are super cute with their scalloped edge but ALSO I love how they are shiny and gold!!! They are grease-resistant which is PERFECT because nothing looks worse than a greasy cake board/round when you're delivering it to someone!!! I will definitely keep ordering as these have been the BEST for my cake AND the best price!!! I will add a picture!!! Excellent value for money. We use them in the bakery for 8 and 10 inch cakes covered in buttercream frosting. Provides a nice presentation of frosted cakes. Nice sturdy cake boards, a great value too. The color does not rub off. They can also be glued together to create a stronger cake base. These cake circles aer great to have when making cakes during the holiday season. It also cuts out the hassle of covering plain cake circles with cake foil. These boards are strong and sturdy with a nice gold color. Easily wiped off so the final presentation appears clean and neat without any hassle. Love these cake boards! They are the perfect size for our cakes and grease-proof! They are very durable and hold up well for heavy cakes! This cake board give an professional appearance for cakes. The fact that it is grease proof is a plus! I don't have to worry about the grease from the cakes showing on the board. I would recommend this product. Beautiful cake circles instantly make your cake or pie look fancy! These are sturdy, grease-proof and really nice looking. We will be buying these again! Great price for such professional look. Easy to cleanup after spills and its actually grease proof: reason why i purchase these over the ordinary ones. Will definitely be ordering more. Great price. It's really nice that these boards are also offered in a 25 pack as well as the case. It is a good way to try them out with out having to purchase a whole case of them. I like that they are very sturdy and well made. I love the laminated part of them since 90% of the cakes we make at the bakery are "3 Milk" cakes also known as "Wet Cakes"... Doesn't make the board flimsy at all. What a great price and these look so nice to boot. I use to buy the plain ones at the craft store now I only use these to add an elegant tough. Perfect for our larger cakes. Thick cardboard and waxed so it doesn't absorb grease or colors. Especially for heavier cakes I like that it I can withstand the weight. I've used cheaper boards that bend in half or sag. These are so much better! 12" Cake circle gold is strong and sturdy, very attractive for 10" double cake. It does not bleed through when we ice them. Happy with product!!! These are sturdy circles that I use to present my 10" cakes. I love that they come in a 25/pack since that is my least ordered size. They fit well in my 12" boxes. These will be a repeat purchase for me. I love to place 9 inch round cakes on 12 inch boards because the presentation is much roomier than if I used 10 inch boards and made the cake looked squished. I will recomended this cake board is very resistent and is like double wall very usefull for cakes also i use for double layers cakes and the price is exelent. Good price and like that I can order just 25. Most other sites have a minimum of 100 and I don't need that many. Happy with product. These things have come in so hand. No more greasy white cardboard cake boards. Great price too. We will be getting more very soon for sure. Love these cake boards ! They look great with our cakes. We usually get a silver board but the gold is so much more modern. I gotta admit this was my first time ordering online wholesale for my business. Well it was well worth it, the products arrive in 2 days, and I have already used the cake circles. The cake board it sturdy to support the weight of my cakes and I like how you can wipe it all clean, to make your product neat and presentable. I love these cake boards because they have a professional touch to them. The gold color and ruffled edge make even a plain cake look its best! These boards are also sturdy and great for even heavy cakes with lots of buttercream. Great size for 10" cakes! They sure do present well too. These were used for a recent wedding and for the price you can't beat it! These gold cake circles add a nice shine to the finish product. It gives it a nice elegant look in my opinion. These cake circles are sturdy and able to handle a single layer cheesecake or a 3 layer carrot cake. The 12 inch circles are the perfect size for a 10 inch circular dessert or an 8 by 8 square. The 12 inch circle also fits comfortably inside the 12 by 12 cake box. These are definitely my go to cake boards for my desserts. This complements all of my cakes perfectly. It is tough, can hold two layer cakes. I would order these again. Hope you have it in silver too. Sturdy and attractive. We sell our ice cream cakes on them and our customers comment on how beautiful the cakes are. The scalloped edges make a great presentation. They are strong and sturdy. I'm not a business, just someone who bakes a lot, A LOT, of cakes for friends, family and coworkers. I love these cake circles. They always arrive in perfect shape and are much more economical than going to my local craft store. I love the gold color, they look rich and I don't have to cover them! This is very durable and is a great statement for your cake. I also put cupcakes on this which is another good use for it. Cool how the gold colour makes our cakes stand out on these cake circles. And the price is very good too. You won't be disappointed with this product. These cake circles are an absolute great value. I love the high shine that they have and the scalloped edges makes my cakes really stand out. The fastest and easiet way to dress up a cake. If you decorate right on this, it's easy to wipe off any extra frosting that may have gotten on it. Pretty to look at and easy to clean. I use these boards form 9" to 12" cakes. Regardless of what size cake they give a great presentation and hold up to a three layer cake with ease. This cake boards are very good, They are outstanding and very sturdy. They are very good quality and stand heavy cakes. I order this and the 12" in boxes. This item is perfect for my cakes. It leaves plenty of room to frost without coming close to the sides or fear of the frosting coming in contact with the box. This cake circle adds elegance to any cake or entremet you are making. I use it for birthday cakes, anniversary cakes, and all types of entremets. 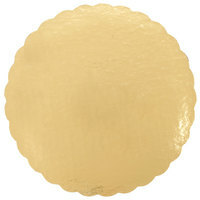 These 12 inch gold laminated gold circles are a good product to have if you have a home bakery. Affordable price come in a package of 25. I will order more! These cake circles are not only sturdy, but they give your cake a different level of elegance. We love to use them when we want to impress our guests. Love these! They make cakes look so elegant and any mistakes you can just wipe right off with a papers towel sine these cake circles and nice and smooth. We got two cases delivered for less than what we paid for one at rest depot in hackensack. Same exact box. Great prices and easy to order. These just add the finishing touches to my cakes, have used these for cookie trays as well as cakes, they are beautiful and the only thing I use for special occasions. excelent! makes your product shine above the competition. For a small home business like what I have, I can do with all the help I can get.